Alexandra Hollingsworth PG Dip GD. Alexandra came to garden design from a business background, working with PwC as a strategy consultant, and with Sainsbury’s as a senior manager. Alex made the transition to garden design whilst living in Ireland, gaining her RHS Level 2 Certificate in Horticulture, and studying for a post-graduate diploma with the Garden Design Academy of Ireland. Shortly after setting up her own practice, Alex won Ireland’s national competition for new designers. This led to her exhibiting a show garden at ‘Bloom’, Ireland’s national garden show, where she won a silver medal. Alex continued to work on a range of private projects in Ireland, before moving back to the UK in 2016 and joining Mazzullo + Russell. With a passion for plants, strong commercial acumen and an eye for design, Alex supports Libby with planting design and sourcing. 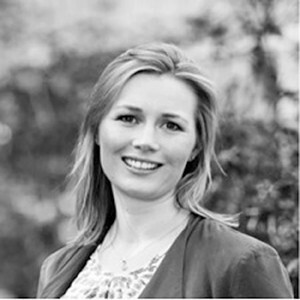 Alex is a student member of the Society of Garden Designers and the Garden and Landscape Design Association in Ireland.